Comic readers, comic lovers, we’ve got to talk about something. For too long there has been a subset of comics that has been largely ignored by the wider comic review and journalism community. Not necessarily for lack of trying, it’s simply an unwieldy, decentralized branch of this medium we all love. There are no publishing juggernauts to market them, no DC or Marvel or Image equivalents. Instead, these comics are disseminated through a wide variety of hosting services, “small” publishers, collectives, and pure, independent creators operating their own websites. Yes, my friends, the time has come to finally talk about that ever present yet always hidden webcomics. While we have touched on this. . . genre?. . . branch?. . . medium?. . . of comics before on Multiversity Comics, in both long form and short form reviews, we have never had any consistent look at webcomics, be it analytically or critically. As I said earlier, this is a failing of the entire industry, not just us. Webcomics just aren’t given the space alongside their print counterparts on sites such as ours. The question remains then, why? Before I try to tackle that, I want to give you an idea of what the webcomic review landscape actually looks like instead of making broad, seemingly baseless claims. Regardless of what my prior statements may have implied, webcomics are not invisible to comic review sites, as evidenced by the multitude of “best of” webcomic/digital comic lists, and even a category on NPR’s yearly summer series, “Let’s Get Graphic: 100 Favorite Comics And Graphic Novels.” Yet, once the award season has come and gone, they disappear into the ether in our corner of comics journalism, with nary a discussion to be heard. We hear all how they’re fantastic and yet come away knowing only a title, a small description, and the knowledge that it has caught the attention of enough people. Where is the breakdown, the lengthier analysis of what makes them award worthy? For those that aren’t on the lists but are no less good, where are the highlights of these? Where is the coverage of the new, the strange, the historic? On sites with recognizable names? No where. Or, more specifically, no where prominent or dedicated. Gizmodo has a webcomics tag but it’s sparsely populated. One of its sister sites, Kotaku has one as well, although it hasn’t had an article since 2016. Newsarama had a column called “The Wild World of Webcomics” which only ran for one, possibly two, years (2011-12), according to the tag on their site. The most recent, and most consistent, webcomics column is from The Beat, though even that one is inconsistent in its updates and still isn’t close to the coverage that “regular” monthly comics get. There are, however, a few dedicated webcomic review sites. These sites tend to be lone blogs run by one person or, in rarer cases, a small team of people. Some are now defunct, such as Wild Webcomic Review and The Webcomic Overlook, (whose site seems to work before redirecting to a page about structured settlements). These are also some blogs that take a broad, general look at webcomics while there are others take a more specific look. For example, the blog Yes Homo boosts and talks about webcomics that contain positive representation of queer characters. The only problem here? As is the case with every other site I’ve highlighted, their output isn’t exactly consistent or wide reaching. This shouldn’t be surprising, as they are run by one individual, in their spare time; one cannot expect a single person to be able to comprehensively and consistently review webcomics. The methodology with which these blogs approach webcomics plays into this as well but that is a topic for another day. As with everything on the internet, I’m sure this doesn’t even come close to touching on the wide variety of smaller blogs that look at webcomics or the scattered posts among other comic review sites. That being said, this is it. These are the biggest, the most comprehensive, the most . . . well, professional places to find webcomic reviews/analysis on the internet. Again, it’s always possible I’ve missed something but in terms of widespread coverage, there ain’t much. My best guesses, and yes, these are just educated guesses, are that there are five major reasons for this lack of coverage. One is that webcomics are a tough format to review in any sort of regular capacity due to a lack of consistent methodology. Do you review it one chapter at a time? What happens if a chapter is hundreds of pages long? Do you do it by month? Or by number of pages? If something updates frequently, does that mean it gets reviewed more? These questions, and so many more, have to be asked by each reviewer and picking one changes the frequency one can review a webcomic or set of webcomics. The second is that due to the nature of lone creators working in their free time on passion projects instead of professionals with an editorial staff. There is resistance to taking a critical eye to these projects and rightly so. It’s one thing to critique a professionally published DC or Marvel or Image comic and it’s another to critique a single page of a new artist who may or may not be young and just figuring it all out. Third, webcomics are the new kids on the block. They’ve been around in their “modern” form since the publication of Scott McCloud’s fascinating, divisive, and wildly, hilariously outdated yet still relevant book Reinventing Comics in 2001, according to The Comic Journal’s article “The History of Webcomics.” I do realize this article is from 2011 making it, much like Reinventing Comics, wildly and hilariously outdated near the end but it still gives a good, brief look into the webcomic world as seen from over half a decade ago. I want to look more into this at a later time as the history and historiography of webcomics is a small but interesting topic. But I digress. Webcomics, despite being new, have found their ways in my and many other internet denizens’ lives. Yet they are still fairly niche, more so than “regular” comics, which despite having been around in a similar format for nearly a century are also still niche and looked down upon by the general public, though not as much as in the past. The market for reviews of a niche part of a niche medium isn’t exactly a large one. Hell, even indie comics, as in unconnected to a named publisher like Black Mask or Aftershock, have a hard time finding space alongside the other floppies on review sites that cover monthly comics. You have to have a big name — Terry Moore, Jeff Smith, Carla Speed McNeil — to even be considered for the list. Fourth, due to the lack of centralization I touched on earlier, finding webcomics, especially new webcomics, is a difficult task. There are, as far as I’m aware, nothing like the Diamond previews for webcomics. If a new series begins, you have to know someone who knows that creator or be trawling through the web/hosting platform/consortium to find it. There is also no list of past, published titles that can be easily searched. It’s all disseminated via word of mouth on the part of the reader or the creator or the collective/platform these comics are a part of. Each webcomic is its own world, sometimes a part of a stellar system comprised of many other worlds, other times all alone in the vacuum of space. Travel between worlds only works if you can see the other planets or take a long, hard look at the stars in the sky. Otherwise, you’ll never quite know what’s out there. And, finally, it could simply be these sites just don’t have the desire to or the staff to cover a wide variety of webcomics. Here is my most speculative point. I do not know the staff numbers of other sites nor do I know the readership numbers on the sites I have cited in this article. However, based on the volume of articles and the number of different contributor names I’ve seen, I can make an educated guess as to the size of the various, non-webcomic focused sites. Some sites have a small staff. Keeping up with news, “regular” comics, and other content, such as comics-adjacent TV & Movie reviews, takes a lot of work and there may not be enough time in the day to cover them. Additionally, I’m sure a lot of these sites don’t make a lot of money, what with advertising and the way ads work on the internet being what it is, and so, unlike a newspaper/newspaper site, keeping staff members on retainer that work all day isn’t feasible. Again, this is just an educated guess. I don’t know how much money these sites make nor who is full-time nor who gets paid per post. This is just the reality of the situation. Remember, Multiversity Comics is a piece of this world. I could also be wrong about these reasons, although I suspect that some combination of these factors is the truth. Motivations are a complicated and many times subconscious thing, guessing at them is a shot in the dark. Do not think ill of us for our mistakes, we are only human. Throughout this article, I’ve talked about the reality of and possible reasons for a lack of webcomic coverage on comic review/news sites. What, then, was the purpose? Was it to just bash on the comic review community? No, no. I don’t believe that would be productive nor would it be right. The purpose of this article was to kick off a conversation, one that I hope gets people talking and changing. As for me, I’m moving on. Not from webcomic coverage, no. This isn’t the end of the larger webcomics conversation, not by a longshot. This article is merely a taste of what’s to come on this front for the month of September and beyond. 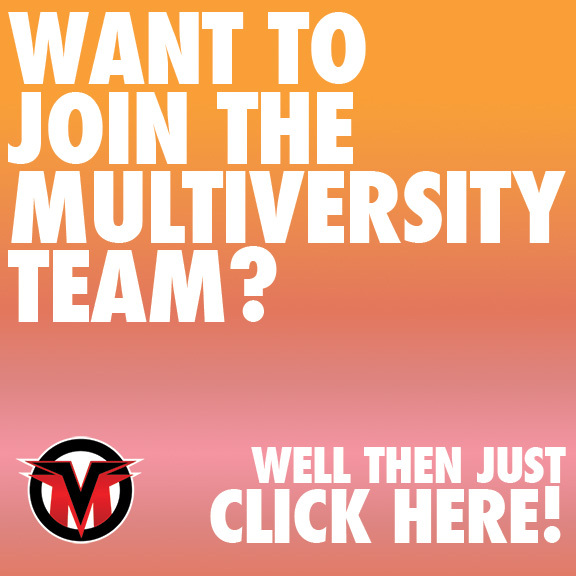 This is the first of a new wave of a variety of site-wide webcomic related content here on Multiversity Comics. As this is a new initiative, it will start out small and, I’m sure, a little inconsistent as we find our groove. I will be back, later this week, for the first piece of our little Webcomics puzzle and then, next Tuesday, join us for the first of our new, weekly review column, headed by Mike Mazzacane and me. Then, later in the month, join me again as I attempt to provide an introduction to webcomics for those who are unfamiliar with them. It will also provide some food for thought, as you’ve just read, on the genre. . . branch. . . medium of webcomics. As for this fairly lengthy post, thank you for joining me. Did I get anything wrong? Did I leave anything out? Sound off in the comments and let me know. Regardless, join us in a week for something new and something fun. See you then!